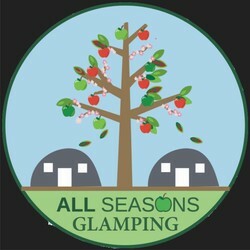 Hi, we are a family run business working on our own fruit farm and our new Glamping Business to offer you an exceptional away-from-it-all experience , with comfort in all weathers. Having been camping with the family we know how much packing is needed when self catering so we decided to offer a Glamping Experience with no fuss or need for you to worry about loading the car up with excessive amounts of 'Stuff' . Come and share the Kentish countryside and if you are lovers of nature and seek an independent style, bespoke holiday, come and stay with us at All Seasons Glamping. We offer a personal service and we are happy to help make your indoor / outdoor stay most enjoyable in comfort and style. Birthday parties celebrate at All Seasons Glamping and enjoy walks across the Greensand Way. Enjoy our natural outdoor 'Green Gym' with plenty of space to walk around the site and get fit for Summer!